Horah! I made it back from the death cabin, vegan Emma didn't kill me off (I was slightly worried) and we had the best few days ever. We frolicked in the woods, foraged for sticks to make fires, took the boat out on the lake, showered under a tree, read hundreds of magazines and newspapers and most importantly ate loads of yummy vegan food. We decided that I would cook the first night, Emma the next and on the final night we'd try and master the pizza oven. I thought long and hard about what kind of fancy vegan meal I could make for Emma, but decided to just go with good old sausage and mash. Vegan sausage and mustard mash. I know most people probably know how to make bangers and mash, so I'll just tell you my top tips. I always use ASDA Lincolnshire sausage mix because they're the best I've found so far. 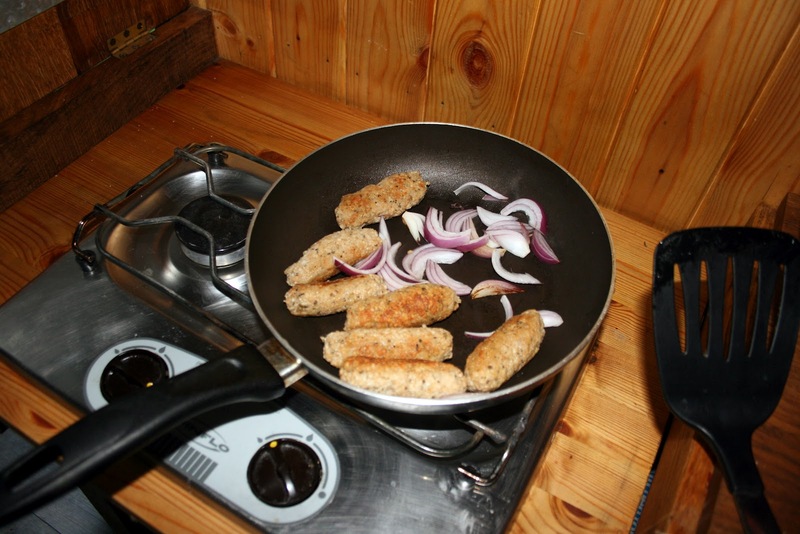 They have a nice taste, the best texture and the packet is only £1 for about 8 sausages! 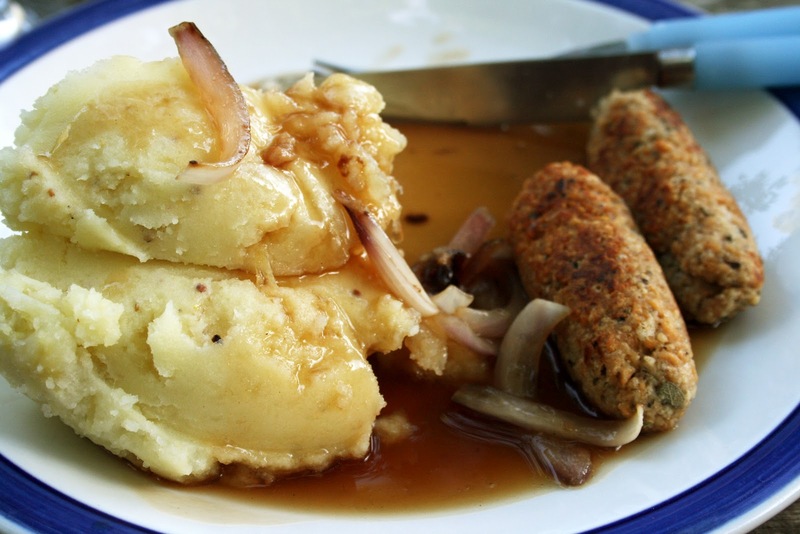 I like to fry the sausages up with some chopped red onion and once the sausages are done remove them from the pan, (leaving the onions) drain the water from the potatoes and pour it on top of the onions, adding some vegan gravy granules to make some lovely onion gravy to pour all over your sausage and mash! And I always add mustard to my mash because I'm a massive mustard fiend who could eat it all the time. If you haven't already tried it, give it a go, it's the perfect friend for your mashed potato! 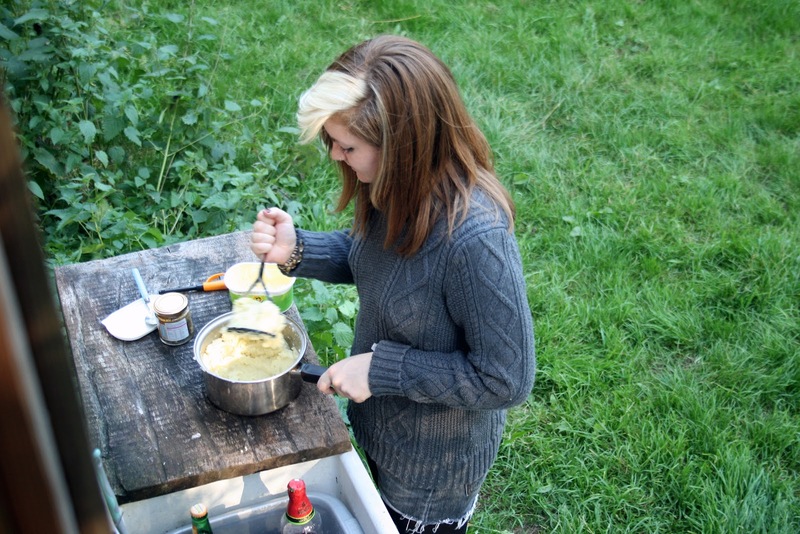 Cooking in the death cabin. 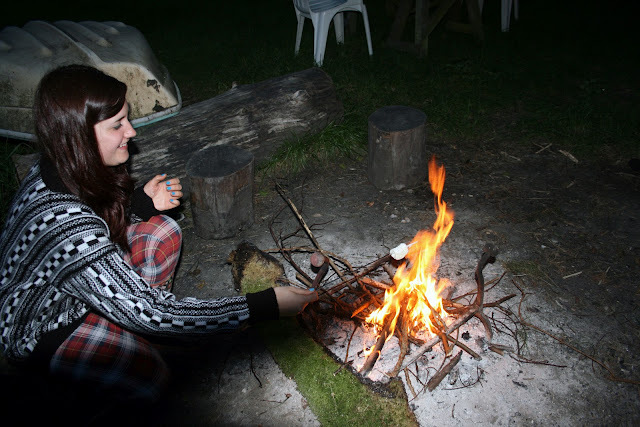 Before we left, we made some vegan marshmallows to toast on the fire. I still haven't managed to perfect them, but this batch was much better than the last (they didn't explode this time!) They managed to stay on the stick just long enough to get nice and toasted on the outside and warm on the inside. If you're ever going camping I'd recommend trying your hand at making them if you're feeling brave (you can buy the kit here) or ordering some from Sweet Vegan (seriously good marshmallows!) If I go again I'll be ordering them out of sheer laziness! I don't normally dress like a crazy person, this just happens to be my pajama bottoms and the warmest jumper I own.